Main Frames available in high tensile cast / forged steel as per requirement. Burr and Distortion free holes. 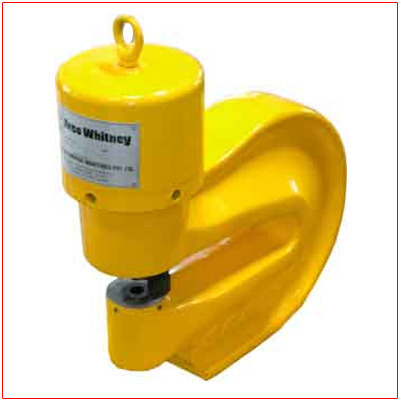 Arco Whitney, is a leading brand name in hydraulic equipments in India and is being manufactured by Classic Automotive Industries Pvt. Ltd. (CAIPL) Pune, India. Our product range specializes in Bus Bar Shearing Machines, Bus Bar Punching Machines, Bus Bar Bending Machines, Bus Bar Notching Machines. Angle & Channel Shearing Machines, Angle Channel & I-Beam Punching Machines, Angle & Channel Notching Machines, Portable Hydraulic Equipment, Special Purpose Presses and the required Power Pack Units. The unique selling points of these equipments are their mobility, smooth operation, short cycle times, distortion free and burr free cutting, punching and bending of stocks. Arco Whitney products are perfect machines. They are being used in Heavy Fabrication of Steel Structures, Ship Building, Oil Rigs, Transmission Towers, Control Panels, Bus Bar Fabrication. These machines are also used in cable manufacturing, metal rolling and extruding mills and many more industries. Arco Whitney products and the after sales services have earned the confidence of our esteemed Customers and valuable Distributors.